This is a Needlework Pillow Kit called: HUMMINGBIRDS. It is a NEW, UNOPENED Kit in the original bag. The colors are as you see in the photo: Cream background with Red & Coral Trumpet Flowers and hovering Hummingbirds. 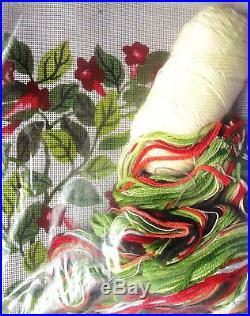 This is a FULL Pillow Kit which includes Corduroy Backing, Piping and Zipper. It is rendered on HANDPAINTED # 12 MONO Interlock with Persian Yarn. 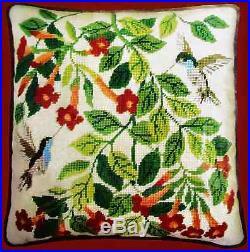 The item “VERY VINTAGE NEEDLEPOINT BUCILLA HUMMINGBIRDS HANDPAINTED Pillow Kit WOOL” is in sale since Tuesday, April 2, 2013. This item is in the category “Crafts\Needlecrafts & Yarn\Embroidery & Cross Stitch\Hand Embroidery Kits\Needlepoint Kits”. The seller is “resplendent-designs” and is located in Upper Marlboro, Maryland. This item can be shipped to United States, Canada, United Kingdom.